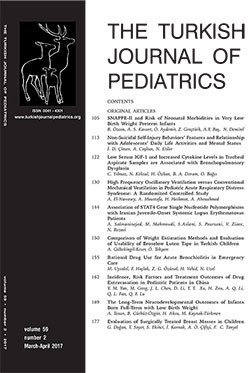 4 Division of Pediatric Neurology, Post Graduate Institute of Medical Education and Research, Chandigarh, India DOI : 10.24953/turkjped.2017.02.014 Goswami JN, Vaidya PC, Saini AG, De D, Radotra BD, Singhi PD. Drug reaction with eosinophilia and systemic symptoms in a child on multiple antiepileptics. Turk J Pediatr 2017; 59: 197-199.